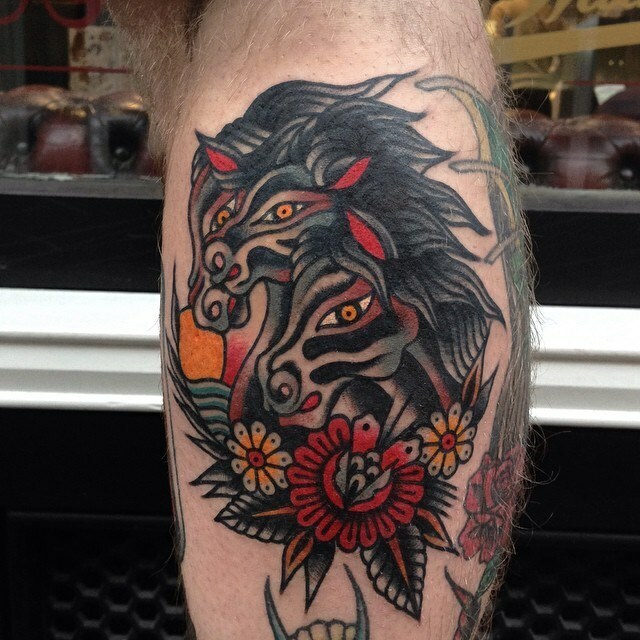 Like many other Traditional tattoo motifs, Pharaoh’s Horses is a design based on Religious Iconography. As told in the bible, Moses split the Red Sea to allow a path for the Israelites to travel to safety. Once they had found asylum, Moses closed the sea drowning the entire Egyptian Army, including their horses, who were close behind. Although there is little known about the artist of the original piece, which is thought to be dated back to the 18th century, the image clearly shows 3 horses in motion being overcome by a stormy sea where there is an underlying sense of strength, power and fear. Aware of the dangers of their pursuit, the symbolism of the piece is seen by art historians as a disregard for consequences and a reflection of the human spirit. The Pharaoh’s Horses imagery strongly lent itself to tattooing, first credited to Gus Wagner’s archive and started to become popular in the industry around the 1920’s. Often seen within a frame and with other Traditional motif’s such as eagles, tattoos of this image are most suited to larger scale designs such as backs, fronts and thighs. The Pharaoh’s Horses tattoo has withstood the test of time as is still a design loved by traditional tattoo collectors and tattooers, including our artists here at the studio.